As part of our ‘commitment to making life easier’ the Argus Fire Protection Service team can go that one step further and ensure your 12As are issued on time taking the hassle out of BWOF management. Our CRM package is second to none so when your warrant is due for renewal, procedures are automatically put in place to ensure a smooth administration process takes place. From start to finish – one contact, no surprises. A Building Warrant of Fitness is very similar to the warrant of fitness that we get for our motor vehicle. For a motor vehicle, a series of inspections and tests are carried out by a qualified person (mechanic) to ensure that our motor vehicle is safe. Once the vehicle passes the inspections and tests, the mechanic will then issue our vehicle with a warrant of fitness. This process is then repeated to ensure your vehicle is safe on an annual basis. This is very similar for buildings. Each building has certain features (specified systems) that need to be inspected and tested regularly by an independent qualified person (IQP). Once these features pass the inspections and tests, the IQP will issue a 12A certificate for these features. Once the 12A certificates are issued, the building owner (or owner’s representative) issues the BWOF (Building Warrant of Fitness). A copy is sent to the local Council (Territorial Authority), and a copy is also sent to the building to be put on display (similar to the warrant of fitness displayed on the windscreen of our motor vehicle). This process is then repeated annually to ensure the building is kept safe. Click here to view the Compliance Flow Chart. 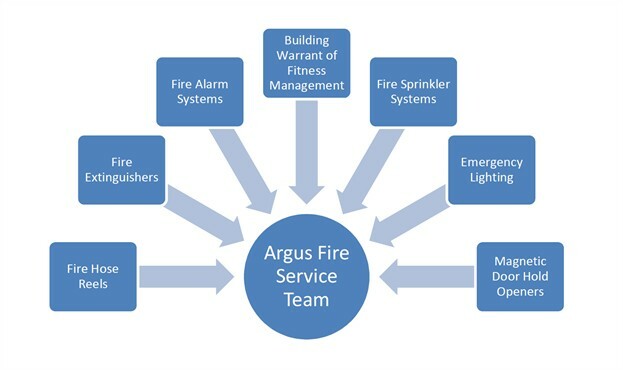 The Argus Fire Protection Service team is totally committed to the provision of timely cost effective and personalised maintenance programmes designed to assist our customers in maintaining and improving their investments in people and property. Argus Fire Protection recognises that within the compliance industry as a whole, accountability needs to be improved. We have backed ourselves to ensure the standard of the service we have been delivering to our clients remains excellent, and have put out a challenge to the rest of the industry.